The Big 12 had an interesting week to say the least. First off, what is the matter with Texas Tech? As I watched Tech play at UTEP Saturday night, I was amazed as one UTEP runner easily dodged four Tech tackles because they didn’t wrap up. Their offense is well-orchestrated and very intriguing to watch with Davis Webb and Bradley Marquez, but if that’s how their defense is going to play the whole season, it’s going to be a long one. The Raiders won their first two games – against an FCS Central Arkansas and a UTEP team that hasn’t been to a bowl since 2010 and won two games in 2013 – by a total of 11 points. The Red Raiders need to fix that problem this week when they host Arkansas, but that could prove to be difficult. Texas looked bad without David Ash as they were blown out by BYU for the second straight year, this time in Austin. The Longhorns made a highlight reel when BYU QB Taysom Hill hurdled a Texas defender for one of his three rushing TDs. No Bryce Petty, no problem for Baylor as backup QB Seth Russell led the No. 10 Bears to a 70-6 rout at home over a mediocre FCS program in Northwestern State. Oklahoma, ranked No. 4, blew out Tulsa on the road 52-7. To wrap up, Oklahoma State ended a 3-game losing streak by beating Missouri State 40-23, a score that looks closer than it actually was. Baylor over Buffalo – Need I say more? Traveling to Buffalo won’t slow down the Bears who are even stronger on offense and whose defense has been stifling thus far. West Virginia over Maryland – The Mountaineers look to be much improved from last year and should avenge the humiliating 2013 loss to the Terrapins, but they’ll still likely have problems in the Big 12. Duke over Kansas – Let’s face it, football isn’t the focus at either of these schools. But, I’ll take David Cutcliffe’s rebuilt Duke squad over the Jayhawks any day. Iowa State over Iowa – The Cyclones almost knocked off a ranked Kansas State team last week. I think Paul Rhoads’ team pulls it together this week. Arkansas over Texas Tech – I think the Red Raiders’ inability to tackle finally catches up with them as Brett Bielema’s Razorback squad rolls into Lubbock for Saturday afternoon’s clash on ABC. TCU over Minnesota – Minnesota hasn’t been too impressive in recent years and Gary Patterson’s teams usually do well out of conference. Oklahoma State over UTSA – Possibly a close game, especially if Garman has to start in place of an injured JW Walsh. The Roadrunners have looked great in their first two games, a blow out win at Houston and a nail-biting loss at home to Arizona. 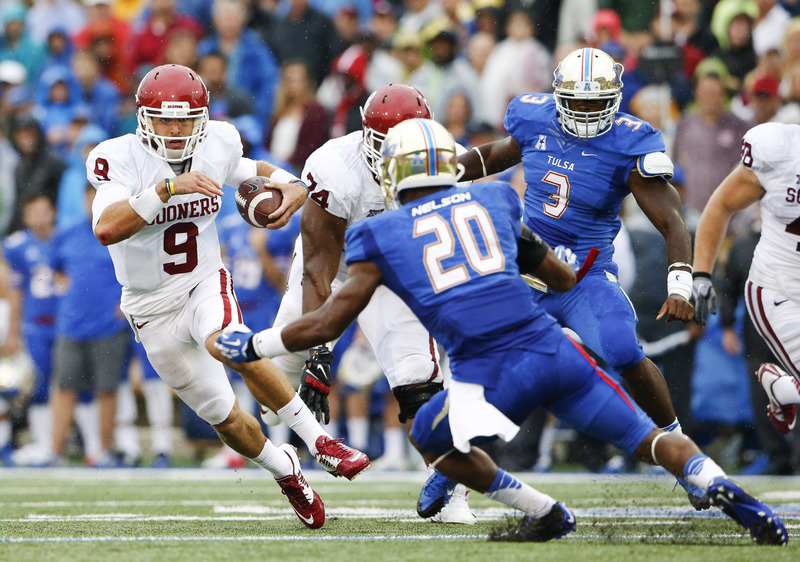 Oklahoma over Tennessee – Really? It’s in Norman and Oklahoma hasn’t lost at home since Notre Dame won in prime time 30-13 in 2012 on their way to the National Championship Game. UCLA over Texas – Not a good time for Texas to head to JerryWorld and play a ranked UCLA team on Fox. Ash being out will likely hurt the Horns until they have their bye week to work Tyrone Swoopes in with the first team and take some of the load off of Malcolm Brown’s back.